Just before the holidays I had the chance to try Coffee Crate, a new Durham-based coffee subscription service that focuses on North Carolina coffee roasters. The box I received included three 4-ounce bags of whole bean coffee from three different NC roasters. This was the first time I tried a service like this and came away very impressed. I think coffee subscriptions are a fun way to try new coffees and make great gifts for the coffee geek in your life. I’m particularly fond of this new service by Coffee Crate because they are local and feature NC roasters, several of which you can’t normally find for sale here in the Triangle. The three individual four ounce bag of beans contained in each delivery go a long way. I enjoyed all three roasters included in the box I received. The coffees featured were a Kenyan coffee from Joe Van Gogh (Hillsborough), a Yirgacheffe, Ethiopia roasted by Mount Air Roasting (Asheville), and a nice espresso blend by Beans Boro Roastery (Greensboro). All three were very fresh (roasted just that week) and made for excellent cups of coffee. 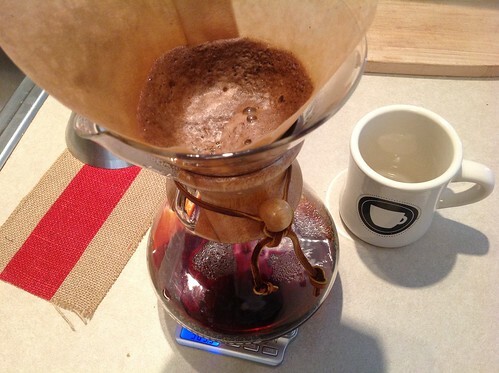 I enjoyed experimenting with the Kenyan and Yirgacheffe using my Chemex and pulled several great espresso shots to make cappuccinos using the Beans Boro blend. As an added bonus the delivery also included a chocolate chip cookie from the Appalachia Cookie Company along with a printout with details about each coffee. Coffee Crate offers multiple subscription options ranging from 1 month, 3 month, 6 month, and one year. Subscription prices range from $29 for 1 month to $23/month if you sign up for a year. Shipping is included in the price. There is still time to sign up for their February deilivery which will offer coffee from NC roasters Enderly, Biltmore , and Reposo. 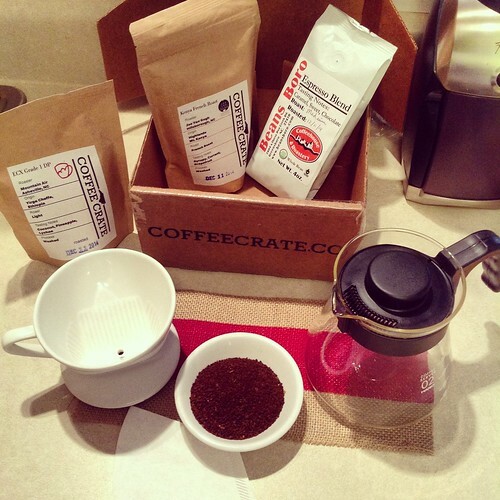 I was very happy with my box of coffee from Coffee Crate and recommend you check them out. 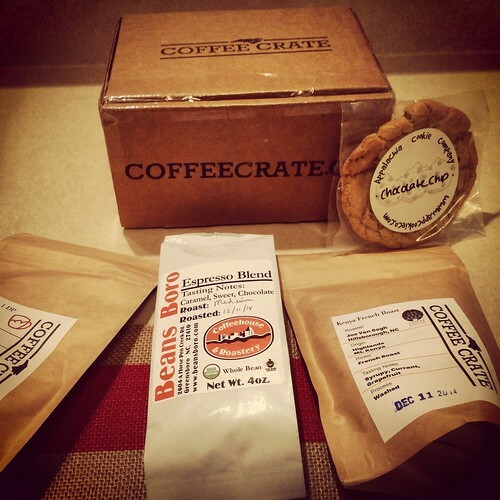 For more details about their monthly subscription service visit their website at http://coffeecrate.co/. Is this heaven? It sounds like heaven. I thought you might like that combo mike! Gotta love it, perfect way to wake up in the morning. This most recent month we had caramels from Red Rooster Coffee! At first I thought maybe you had the wrong roaster, but turns out there are two Red Roosters! Ha! Thanks for pointing this out Aaron. You are absolutely right! I always get these two roasters mixed up, but honestly I must have been in a fog because of course you are talking about the the Red Rooster located in North Carolina. 🙂 I’m a fan of both! I’m sure people will really enjoy this month’s coffee crate!